The Norwich terrier is one of the smallest of the working terriers, weighing 11 to 12 pounds. The height is ideally 10 inches at the shoulder. The body is long and the head is fox-like. A Norwich generally matures at one year, with full size attained between 6 and 8 months. The Norwich coat is short, harsh, wiry and straight. The breed has a definite undercoat. This dog sheds twice a year and requires brushing and combing twice a week. The color can be red, wheaten, black and tan, black and gray, or red and white mixed in a grizzled pattern. Norwich terriers are active, intelligent dogs. They do not make good kennel dogs; they prefer being with their guardians and characteristically are interested in everything their guardians do. Typical terriers, they are energetic and capable of much mischief, needing plenty of things to do or they will find something. They tend to be stubborn. They excel in earth dog and agility trials. Having the terrier instinct to roam, these dogs are generally untrustworthy off leash. Their curiosity and hunting urge draws them to roam and explore every cranny. Like all terriers, they may chew and dig if bored. 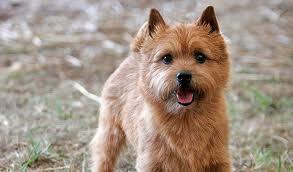 Norwich terriers need a large amount of interaction with people. They tolerate other dogs and cats well, if raised with them. The Norwich’s heritage of ridding vermin makes them apt to kill other small pets such as rodents, birds and reptiles, so these should be kept away from the Norwich. Norwich terriers make excellent watchdogs but poor guard dogs because of their size. They can bark excessively if not properly trained. They also will pull on the leash. They enjoy outside activities. The Norwich Terrier is ideal for a guardian who wants a small, active dog who does not require a large yard and can be contented with frequent walks, games of fetch, and other activities. They do not do well left alone for long periods. Norwich terriers typically live from 13 to 15 years. The Norwich Terrier, close cousin to the Norfolk Terrier, originated in East Anglia, England. These dogs were sought as ratters and, by the 1880s, were popular at Cambridge University among the students. One dog named Rags who lived at a stable near Norwich became the founding sire for the Norwich Terrier. Through selective breeding, horsemen bred other terriers to Rags and his offspring to produce a ratter and a fox hunter. The Norwich terrier was introduced into America in 1914. The American Kennel Club recognized the breed 1936. The Norwich and Norfolk terriers were considered as two varieties of the same breed until 1979, when the AKC recognized the Prick Ear Norwich to be a separate breed. The Norwich terrier is the quintessential terrier. He is feisty and tough. He delights his guardian as a faithful companion as well as an accomplished ratter.